Trigun was something that was on my list for a very, very long time. As a self-proclaimed fan of 90s anime, Trigun was a necessary pit stop on my quest for discovering the best anime that decade had to offer. After 26 episodes (and a film that came much later), I can say with confidence that Trigun was worth the effort. My experience with Trigun was very similar to how I approached Akira, as I was able to read the manga before watching the series (although not the Trigun Maximum series). This allowed me to get a glimpse of the series' origins before taking the visual plunge. It's not a bad way to approach the show, as it adds a bit of nuance to the experience, but nothing will be lost from viewing the show without reading first except for a greater appreciation for the manga. With that being said, the anime is not 100% faithful to the manga, but it still captures the atmosphere and tone of original text quite masterfully, and those qualities are especially important when it comes to the narrative of Trigun. 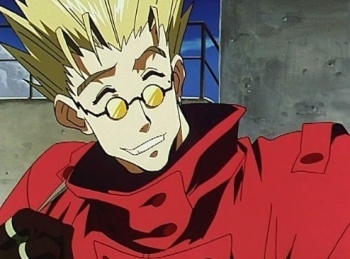 The series chronicles a series of adventures in the life of Vash the Stampede, known as "The Humanoid Typhoon," and later known as the first human to be labeled a natural disaster. The first episode spends a little time building up this myth, as bounty hunters all over the planet of Gunsmoke are teaming up in order to catch the Humanoid Typhoon, who currently has a $$60,000,000,000 (Yes, that's double dollars) bounty on his head. It's not long before we learn that this "Natural Disaster," is really just a carefree individual with a heart of gold that can't help but get involved when he sees an opportunity to care for others. This leads to countless duels with some of the toughest, meanest outlaws and bounty hunters Gunsmoke has to offer. 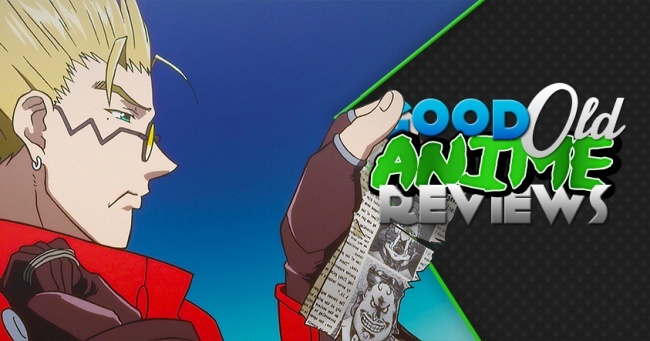 The first ten or so episodes are fairly self-contained stories that don't really build anything up but Vash's relationship with two insurance agents, Milly Thompson and Meryl Stryfe. After that, Vash's background starts to flesh itself out, revealing that there is more to the Humanoid Typhoon than meets the eye (or the wanted posters). I don't want to spoil too much, but Vash does have a plethora of secrets that are slowly revealed as he takes on the Gung-ho Guns, a series of deadly criminals all after Vash's head.